Its productivity and gaming performance are reasonably high in its price range. The machine has a high score, close to high-end systems. It has decent ports, backlit keyboard, Full HD display making it a formidable laptop for multitasking. Fast processing speed and high system memory. Portable and can be used for multiple tasks. Not reliable if pushed to the extreme limit when gaming. Designed for superb gaming, the Asus K501UX laptop delivers stable performance way above its rivals in the market. With this Asus gaming laptop, you can be sure of a smooth experience. It delivers a quality gaming touch on high settings thanks to its 15-inch Full HD screen display. It has the GTX 950M NVIDIA GeForce graphics card for sublime performance. The machine is made to accommodate other tasks such as media and daily jobs when not playing. While the Dell Inspiron i7559-2512BLK gaming machine comes with a true Quad Core-i5 processor, the K501UX gaming laptop offers stiff rivalry with its dual Core-i7 processing power. Worth noting is the unbelievably friendly price tag. While it comes with top features, this Asus K501UX costs way less than most of its market rivals. It has lived to prove its potential in the gaming world. There is tons of interesting stuff on this PC. It features some of the world’s most recent features, notably the 6th generation (Skylake) processor. This makes the Asus line a monster in gaming and other tasks. As it will be highlighted below, the sufficient system memory and graphics make it a reliable system for modern PC users. It delivers sufficiently making it a coveted choice in the market. 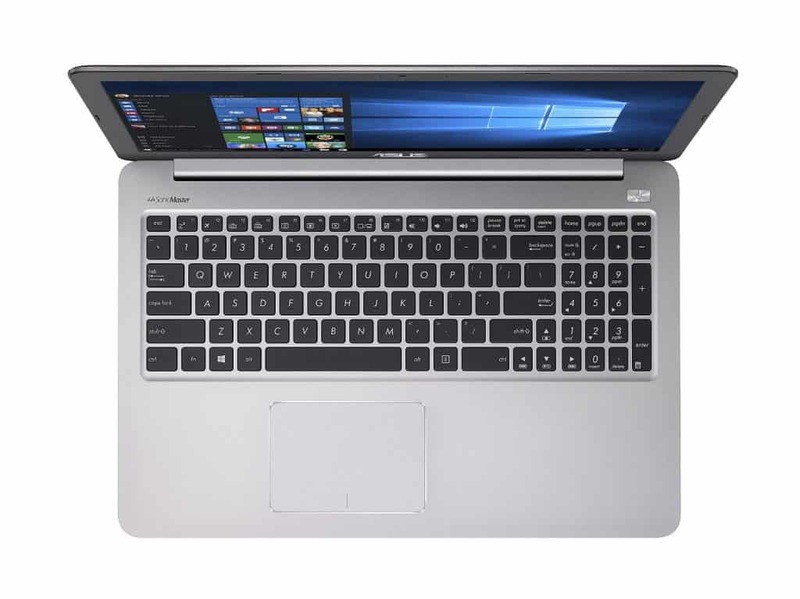 The brushed aluminum cover of the Asus K501UX does not deviate from the Asus renowned design. It has been fairly constant over a number of their iterations. However, the new entrant comes in a classy dark blue metallic cover that has a hairy finish. It weighs 4.4 pounds and measures 0.9 by 15.0 by 10.0 inches. It is way thinner and lighter compared to Dell Inspiron i7559, its main market competition. This is the machine for anyone looking for portability and performance in one package. 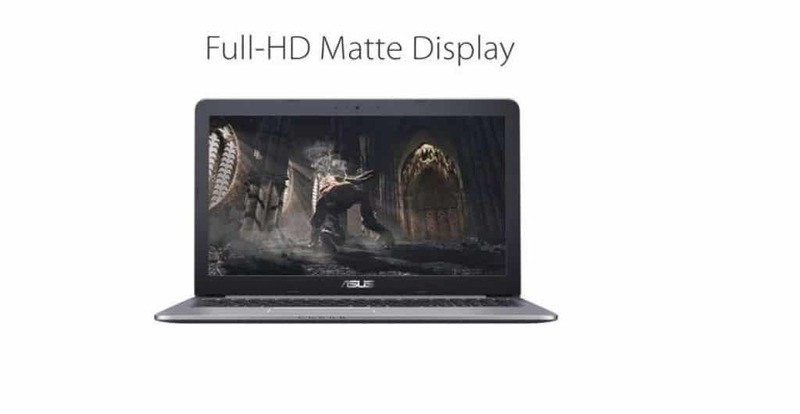 The Asus gaming laptop comes with a Full HD resolution supported by the non-touch 15.6-inch matte TN-display. This is the perfect machine for professional video and image editing. The full-size chiclet keyboard is backlit. It has an intuitive touchpad with a breathtaking audio output. If you love exteriors, then you will die for the K501UX creativity. It has a pair of 2.0 and 3.0 USB ports, one HDMI-out port – to connect with HDTV or external monitor- and an SD card reader. 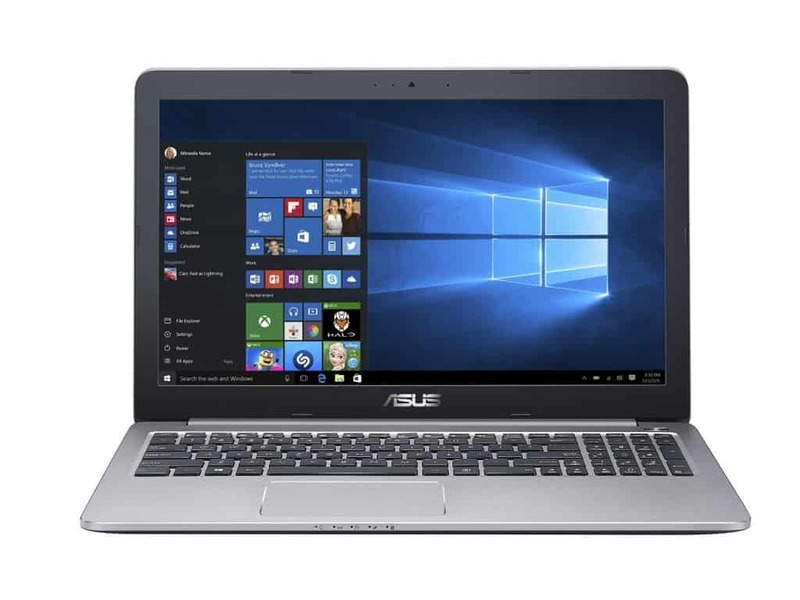 With most manufacturers doing away with external DVD/CD drives, it is not a surprise to see the Asus K501UX lacking one: you can download your utility applications over the internet. Connecting to the internet is on an RJ-45 Ethernet port or the 802.11 A/C WiFi. You may enjoy Bluetooth 4.0 connectivity. The VGA camera allows you to chat and game at the same time. The 3-cell battery can last you 5 hours. It is an acceptable machine for daily tasks and won’t let you down. In the modern world, a good laptop must feature sufficient connectivity. It should allow enough ports for external connections and networking. This is exactly what an ideal machine like Asus k501ux laptop offers you. The system is designed with two USB 2.0 ports and another two USB 3.0 ports. The machine comes with an HDMI out port that allows for high definition output when connected to an external monitor. Using this laptop with an HD TV is quite impressive. An SD card reader is also present. Like most modern systems, there is no DVD/CD drive on this laptop. I never found this to be an issue, though. We have come a long way, and most manufacturers are now shelving this feature. With OS being downloaded directly from the cloud, this feature is no longer a necessity. Connection to the internet is obviously very important for your new laptop. The ASUS K501UX laptop comes with the RJ-45 port for LAN connections and a super-speed 802.11 A/C WiFi adaptor for wireless connections. You can share files over the Bluetooth thanks to the Bluetooth 4.0 connector. If you love gaming and do a bunch of other tasks, this is the perfect machine for you. It has quality connection ports for your connection to other machines too. Every gamer is looking for an incredible machine that can perform at high processing speeds and quality memory. This is what Asus K501UX is giving you! It comes with 2.5 GHz Skylake (sixth-generation) Intel Core i7-6500U processor that can be boosted to 3.1 GHz on Turbo and an 8GB RAM. The system performs highly thanks to the discrete NVIDIA GTX950M graphics card that has 2GB DDR3 memory. The dual-core processor gives a top speed performance that has received a whopping 4300 point on CPU Mark points. This is a decent performance for a notebook. The huge system memory and graphics card ensure that your gaming experience is smooth and no lags at all. The features work coherently to deliver superb performance on all your daily tasks. The 256GB SSD makes it faster than the usual HDD. The 8GB RAM plus the 4GB modules that are stuck on the board makes it 12GB of system memory and can be extended. The GeForce graphics card ensures that you have quality gaming display at Full HD (1080p). You can be sure to get up to 30 FPS. This laptop delivers quality gaming thanks to a combination of features: fast processing speed, high system memory, and sufficient graphics memory. It is less expensive as opposed to most rivals in the market. It is portable and can be used for multiple tasks without any complications. It is easy to use thanks to its reliable interface and external connectivity ports. 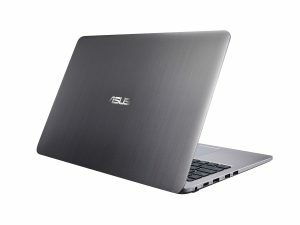 The Asus K501UX laptop trails the Dell Inspiron i7559-763BLK by ~7500 CPU Mark, thanks to the model’s Core i5 Quad-Core processor. If you push your K501UX machine to the extremes, you might not like it. This machine cannot face off with its main rival, Dell Inspiron i759-763BLK, in terms of graphics memory. The competition offers a cool 4GB GDDR5 NVIDIA GTX960M graphics card, thus better gaming experience. With multiple tasks thrown at most laptops today, ASUS K501UX laptop proved to work immensely well. Our review team experienced no mishaps at its top utilization. In many respects, this machine has lived to its expectations. It can handle multiple office jobs, entertainment and still stream live HD videos over the internet with lags. It does not overheat even at maximum usage. The performance here is undoubtedly all you have been looking for in a modern laptop. Multi-tasking is a term that has been put into work in this machine. It has enough RAM to allow concurrent jobs to execute at a go. If you are a typical gamer, this is your machine. One thing is for sure: no one buys a laptop for just one task. ASUS K501UX laptop is made for a variety of tasks. It is good for jobs that require massive processing capacity. Its Intel Core i7-6500U, 6th generation (Skylake) processor will deliver in every situation. The processing unit clocks up to 2.5GHz and can be boosted to 3.1GHz on turbo. It is an excellent notebook for advanced users. You can watch games, stream live on the internet and browse all day. It is a great machine for daily tasks like office tasks. With an excellent RAM of 8GB, I felt the massive memory was enough to accommodate multiple jobs concurrently. A good point to note is the fact that of the RAM memory, 4GB is onboard memory. The remaining 4GB is removable. The memory can be expanded to 12GB making this a monster machine. Its massive 256GB SSD (Solid-state drive) is enough for launching applications. It is fast and very efficient. You can also add external hard-drive if needed. Working on a large, 15.6” touch-screen HD display is nothing less than a modern way of doing things. It can be the easiest way for professionals to do their jobs such as image and video editing. It comes with a matte TN (Twisted Nematics) panel. To give an insight, the graphics are well-handled thanks to the NVIDIA GeForce GTX950M memory. The 2GB dedicated GDDR3 chip is enough to deliver quality video and gaming experience. I found it very attractive even on new titles like GTA5. Its Full HD resolution will just amaze you. With most games, the ASUS K501UX laptop is built to reach up to 60FPS. In the sake of fairness, this ASUS machine does not come with massive flaws. Its gaming performance and connectivity features are of advanced levels. However, the line does not feature the best features in the industry. Its performance should clock better speeds if the machine is to be considered the best. The machine is resource-intensive. It depends on immense power to deliver adequately. The processor, RAM, and fast storage all require enough battery capacity. The screen too is Full HD, and the display needs more power. It takes a good battery to run such a system and more often, this is a downside for this laptop. The value that comes with the Asus K501UX laptop is immense. The laptops productivity and gaming performance are reasonably high in its price range. The machine has a high score, close to high-end systems. It has decent ports, backlit keyboard, Full HD display making it a formidable machine. While the new upgrade Asus K501UW-AB78 comes with similar specs but a heftier 512 SSD, better battery life and Full HD IPS display, the K501UX laptop has remained one of the best gaming systems of its price range. It has given its rivals a reason to struggle for an upgrade and thus a reliable system. Stay tuned here for the latest tech reviews and news.